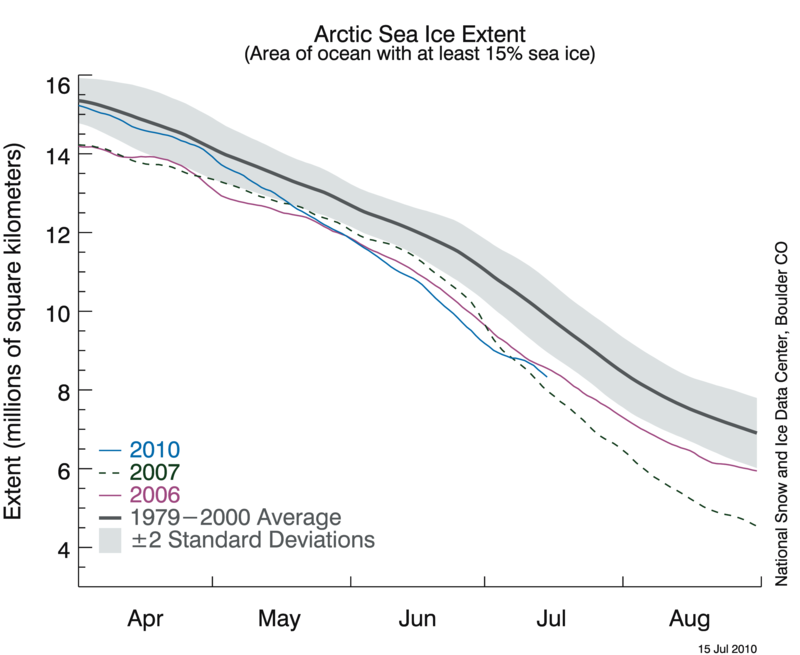 Sea Ice News #14 – an inconvenient July | Watts Up With That? We are seeing a number of interesting polar ice milestones this month. First, WUWT now has a new permanent Sea Ice Page, where you can find all of the live graphs and images in one place. Details here. 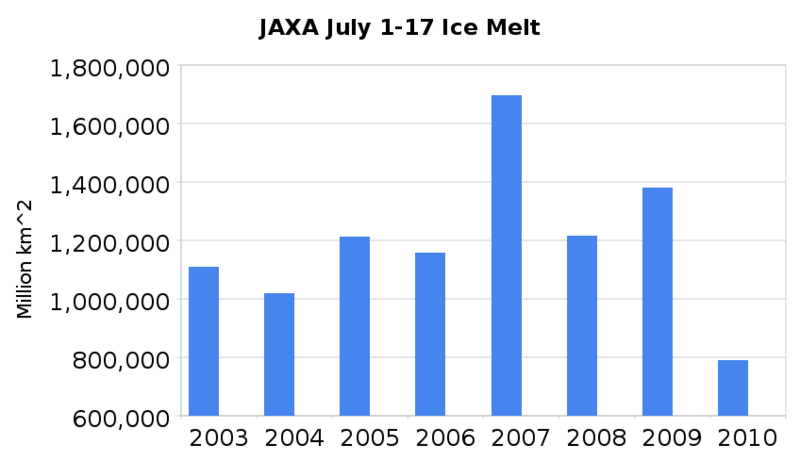 Second, it has been the slowest July (1-17) Arctic melt in the eight year JAXA record. Ice extent has declined at less than half the rate of 2007, and total ice loss has been more than 200,000 km² less than the previous low in 2004. DMI now shows Arctic ice extent as second highest for the date, topped only by 2005. Cryosphere Today shows that ice extent and concentration is about the same as it was 20 years ago. The modified NSIDC map below shows in green, areas where ice is present in 2010 but was not present in 2007. The modified NSIDC map below shows (in red) ice loss over the last week. Note that ice extent has increased slightly in the Chukchi and Beaufort Seas, while it has declined slightly in the East Siberian Sea. The modified NSIDC map below shows the record low ice loss since the first of the month. The modified NSIDC map below shows ice loss since early April. The graph below shows PIPS ice thickness over the last five years. Average ice thickness in 2010 continues to track a little below 2006. It should bottom out in the next week or so between 2006 and 2009. The low ice loss is consistent with the low Arctic temperatures we have seen this summer. The North Pole webcam below shows that the meltponds are frozen over. Temperatures have been below -5°C this week. Very cold for July. The video below shows ice movement since the start of June. 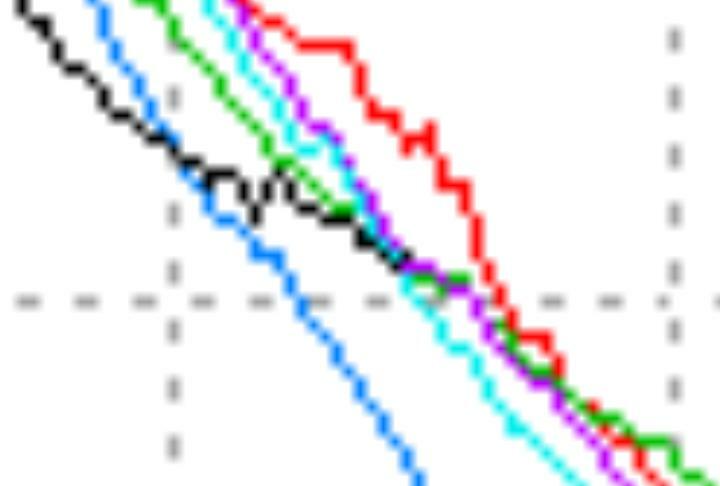 Note that we are starting to see a clockwise circulation setting up again, which hints at increased ice loss over the rest of the month. Another factor suggesting increased ice loss is the NCEP forecast, which projects warm temperatures over the East Siberian Sea and Arctic Basin for the next few days. A third factor suggesting increased ice loss the rest of the month is that the the ice concentration has declined, due to winds exerting tensile stress on the ice. This allows more sunlight to reach the water and warm it. I expect to see the ice extent graphs showing steeper losses towards the end of the week, primarily in the East Siberian Sea. GISS thinks it has been hot in the Arctic. This is primarily due to the fact that they have almost no coverage there, and that they make up numbers extrapolate across vast distances with no data. Meanwhile down south, sea ice continues at a record high level for the date. July has been typified by record low ice loss in the north, and record high ice gain in the south. Global sea ice is above normal. and if this trend continues………. Yes, a trend from 2007 and ahead shows that we are all gonna die before 2035! Please, Mr. President, can you help us? Ice-Tax for long-drinks? The DMI Temp graph is doing what it did last year and then some. Yes, the MSM will be serving more bilgewater to it’s mushroom base. (How to raise your mushrooms – keep them in the dark and feed them moist garbage). So, it’s now in a *horizontal* death spiral…? If there is a bunch of snow that has been deposited on the ice, wouldn’t that help protect the ice, even for a short time, from melting? The warmer air that gets brought in, plus solar radiation, would have to work on that first before the ice. Looks like CO2 didn’t stop all the heat radiating away. It looks like the forecast made by “Gavin” in a previous Arctic ice thread of 2010 losing more ice than 2007 will be wrong. REcord sea ice in September would be a boon – it would be good to try to see the thermofascists spin their way out of that one! It would not surprise me if they decommissioned those satellites since they don’t show what we are supposed to be responsible for… the rapid heating of the earth. Wow, based on the y-axis label, that lead graph says the ice melt dropped by 600 trillion square kilometers from July last year to this year. Thats a lot of ice cubes! 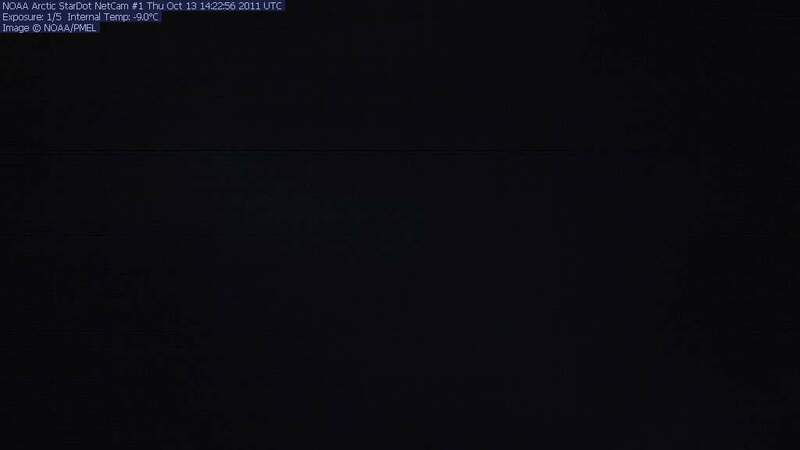 That webcam picture is from webcam 1 and is dated 7th of July – that particular camera is apparently malfunctioning, since it hasn’t sent a picture since then. The second webcam shows open, unfrozen melt ponds as of July 18th, 7:20 am – the pictures since then are however obscured by snow. Wew, thank goodness! For a few years there, I thought we were all going to drown! Well, I’m off to check the return policy for these life-jackets and inflatable rafts. Did Athony of Steve post this? I assume Anthony! Anyway does this NOAA forecast graph for August 2010 to March 2011 have a place somewhere on this post. It looks like cooling at both poles for Jan Feb March 2011!!!!! Note also that the linked temperature record from the buoy near webcam 1 is acting weird: temperatures dropped 5.4 degrees in a single hour at 2am on the 15th, as seen in the excerpt below. That looks like some kind of technical error to me rather than real data. “Global Warming”, or should I say “Climate Change” can freeze up the poles too. Didnt you know? Anything can happen when we have “Climate Change”. Great work with the new ice page. No more having to search around the web. Another intereresting story is the norwegian expedition by norwegian polar explorer Børge Ousland, who started at midsummer on a trimaran sailboat, aiming to start from Norway (they are currently at the northern tip of Norway, then circumnavigate the pole, sail through the northwest passage, along the western shore of Greenland, and back to Norway. So a polar 360, one could call it. All during this summer season, of course. Part of the deal is, of course, to “bring attention to global warming and melting ice”. Will they be able to make it? Or will they put their warmist cause to shame? Anyone want to make a calculated guess? Perhaps I’m misunderstanding, but isn’t sea ice then at its seasonal minimum, so shouldn’t that be a “record high minimum”? I recall reading last year that the ice would rapidly melt because it was thin, first year ice. They called it “rotten” and “flippy floppy”. Not joking!!! I wouldn’t mind if it melted if it would send a little cool air down here. Temperatures have been very cold at POPS-13 as mentioned in the same paragraph. Below -5C in the last 24 hours. Chances are that the former melt ponds are frozen solid. Most of the world’s sea ice is in Antarctica, so the maximum occurs in September. If you look at Topaz, however, or the Cryosphere Anomaly chart they show the lead of 2007 over 2010 as less than half the others. – – the difference is that area North of Alaska that has filled up with “brash” — like Ice cubes — Topaz sees it as Open Water ! Apparently, so does Cryosphere’s Anomaly measure..
– – one must download the pic & then paste pieces of 2007 near 2010 … well, I need to. A good Photo program can superimpose.- – And Steve: why gild the lilly ? JAXA data has 2010 July 1-17 at 849,532 … Which is ‘way below every other Month, but you have to put the bar BELOW 800,000. That’s why everyone distrusts ALL your homemade Charts, Steve. And most of them I’ve found where your sources are & they are Real..
And most of this Post – – is right on the Nail ! July17-18 ______ – 71,406 ____ – ?? Where are the ‘rotted ice’-ers who were feeling victory in June? None of them are in this thread. No, there is a major minimum in global sea ice in February/March and a minor, less pronounced minimum in September. The maximum is in November. This is caused by the unevenness of how much of each latitude band in both NH and SH is covered by land and therefore cannot have sea ice. Steve, a bit cheeky this, but are you going to revise your prediction up? It’s looking highly likely the ice extent is going to be higher than you thought! Overall sea ice is showing strongly positive v anomaly, (cherry picked anomaly at that), looking forward to September for the ice and then November for our American cousin’s mid terms. We are living in interesting times. Still reckon minimum 2010 NH ice will be within 1SD normal or spot on normal due to increased ice concentration. Technically OT, but has NCDC been monkeying with U.S. temp data? WUWT? Remember this article? (“Snowfalls are now just a thing of the past”). I occasionally revisit the article for a chuckle. It is only today however I note that the Independent has completely removed all of the comments attached to it, many of which were naturally pointing out the complete BS being promoted by the author in light of recent events. Yet another one of those simple acts of censorship that help to redirect the agenda. The NOAA2 cam images are interesting in that they show the ponds sometimes skimming over with ice. There was a rain event a day or two ago there and now the cam lens is covered with ice. So those ponds aren’t only melt, they are also accumulated rain/mist/other precip. The latest DMI temperature graphs really have the temperatures low for this time of year and the current average looks like it is less than 0.5C. Precipitation (snow) melts at 0C but sea ice melts at a lower temperature depending on salt content. The older the ice, the higher the melting temperature as older ice has more of the salt worked out of it. The newest ice will melt at around -3C or so. Going back through the DMI archives, I can spot no other year with temperatures this low at this date. Now to be sure, temperatures are fickle and subject (like most anything else) to wind behavior so things could change any day. > melt in the eight year JAXA record. Actually, they have partial data for 2002, including July 1-to-28. The July 1 value was 10,043,906 and July 17 was 8,756,250 for a loss of 1,287,656 km^2. So 2010 is the smallest loss in 9 years. It’s worse than you thought. I don’t see any reason to revise my 5.5 estimate. I expect melt to pick up later in the month. Dateline used to have credibility! PROFESSOR KERRY EMANUEL, CLIMATE SCIENTIST: Why would anybody ask weather forecasters about their opinion on climate? I think it is because there is a hope that I don’t think is justified that ordinary people will confuse weather forecasters with climate scientists. SBS: Professor Kerry Emanuel is disparaging about what he perceives to be a lack of knowledge amongst many meteorologists. 30 June: Nature: Jeff Tollefson: Climate science: An erosion of trust? Researchers at George Mason University have teamed up with Climate Central on a project to see whether meteorologists on television can change the way people think about climate issues by making global warming into a local phenomenon. Beginning this summer on the television network WLTX in Columbia, South Carolina, weather forecaster Jim Gandy will integrate global warming into his coverage. Topics might include projections for increasing weather extremes over the next century, and how local gardeners are adapting to climate change. The George Mason team will use surveys at the start and end of the project to see whether it has any effect on public opinion. this is quick, Jim Gandy! Beginning in July, the next phase of the National Science Foundation-funded study will begin. A test case at Gandy’s station will include 30-second segments in some of the weathercasts to educate viewers about climate change. We’re broiling in the DC area. One of the TV weathermen said that the jet stream was staying north. Could this be why the N pole is staying colder than normal? I’m still here. 🙂 At present, the ice is certainly not behaving as I expected it to. Well done to Steven Goddard. 🙂 However, I am still not convinced that the ice is in a high volume state – the images on modis appear to show lots of broken (and perhaps rotten ;)) ice, even around the area of the pole. So I am still anxiously waiting on September. Nothing like being able to demonstrate first-hand, with example after example, graph after graph, truth after truth. It is just a strong Bermuda High. It is also the reason there have been no hurricanes on the Eastern Seaboard. Weather, not climate. The temperatures in the center of the country are below normal. Mexico is WAY below normal. In fact, nearly the entire equatorial region of the planet is below normal. As of 2011 will they start to use a 1989-2010 average, following on from the current 1979-2000 average? Or will they instead chose a 6,000 BCE – 2010 CE average to maintain the downward trend? I can’t find any DMI temps dipping quite this early, but 1972 and 2001 had similar dips shortly after this time of year. While it is far too early to start crowing, I must admit I’ve begun rummaging in my giant drawer of smiles for the chesire cat one. . .. y’know, just so I know where it is should I want it in September. Volume matters when surface area is low…surface area matters when surface area is high. Got it. Could you also include links to the latest cloud cover images (since cloud cover is related to temperature)? I just spent 10 minutes looking, and, lots of NOAA website links are broken or don’t actually have imagery. Just where did you find THAT ??? That says it all, doesn’t it? Cold months do vary the most. Day by day, year by year there are some ups and some downs but over the many years it feels the same today as in 1960 or 1980, and guess what… it is exactly the same !!!! Anthony, post that one BIG and PERMANENT so all can link in emails to their family and friends (and adversaries) !! Thanks DR, just what others like me have been looking for, at least one small smoking gun with NOAA’s logo on it! The melt rate may have already picked up. The JAXA AMSR-E Arctic sea ice extent data shows the last two days losing over 70k sq-km per day. 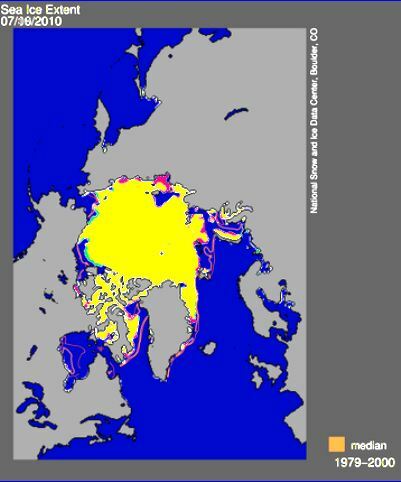 I’m new to this AGW debate but I have a question about the extent of sea ice in the artic. If ‘during June, ice extent was below average everywhere except in the East Greenland Sea, where it was near average’ (NSIDC comment) why is everybody happy about the extent of the ice this July if it is below average? Steve if you’re going to make stuff up at least make it plausible! You continually want the reader to infer that Steven Goddard is deceiving people. Today is not the first time you imply it. I’m just impressed at the correct use of both “infer” and “imply”!! The DMI is something to keep an eye on. It never gets very warm up there anyway, but it is curiously low this year, just like last year. …total ice loss has been more than 200,000 km² less than the previous low in 2004. I wouldn’t be too worried yet. 70,000 sq km is fairly average for this time of year. What we’ve had for the first couple of weeks in July was well below average. The east Siberian Sea still has a fair amount of ice to lose and when it does it normally does so quickly. I agree with Stephen that we’ll see an increase in the rate of ice loss for the latter part of July but I still think once the ice is gone from the East Siberian Sea it should start to reduce again. Incidentally, the 312,000 sq km between 2010 and 2009 is likely to disappear very quickly over the next 2 weeks. During 2009, the average ice loss per day for the last 2 weeks of the month was over 93,000 sq km. I’d be very surprised if we see that level of ice loss for the corresponding period this season. 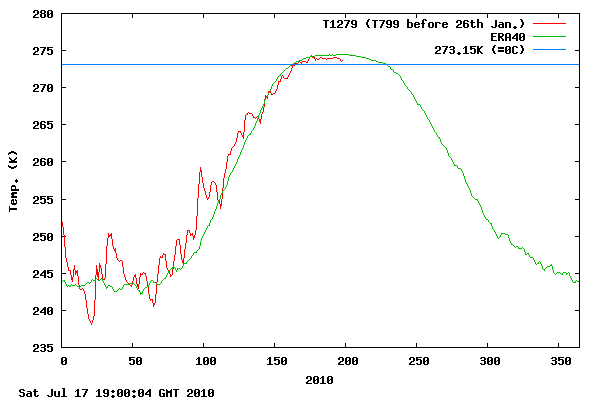 If we maintain a 70,000 sq km average by 1st August, this years ice extent will be nearly identical to 2009. I’m still looking for a similar result to 2006. Looking at ice loss rates over the entire JAXA data set I find it unlikely we will see the rate of ice loss climb above 60,000 sq km on a 15 day moving average for the remainder of this melt season. “Better English” will not rescue the mathematically challenged. “Ice loss” is an inverse term in relation to an “ice low” level, thus a smaller ice loss means the present ice level is greater (>200K km²) than at the previous low in ice level. One look at the Cyrosphere Global Sea Ice Extent does it for me. It says that when all is added up, the Global Temperature should be just about average. A Global Climate reality check, if you will. Steven Goddard: I don’t see any reason to revise my 5.5 estimate. Hi Steven, can your 5.5 estimate be compared directly to the Cryosphere Today measure? If so, CT suggests it may be broken soon. He’s already in trouble. He just doesn’t know it, yet. His hull and outriggers use straight bows, rather than reverse shear or spoon. Not a problem if you weight the aft and you’re hauling up onto a sloping beach, but those chisel bows will dig into the side of a good-sized floe rather than sliding up and onto the top. And if they need to pull the boat onto the ice, they’ll *need* to be pulling it onto a good-sized floe — the boat weighs almost three tons. That said, he’s got a good-looking boat, and I hope he doesn’t have to find out the hard way. Mike D – what it means is that 2004 had the lowest total ice loss. this year lost 200,000 less than 2004. Anyhoo I’m quite amazed that you’ve put in so many maps but not the one showing that arctic sea ice extent is at an all time low for the date at NSDIC. You know it exists as you’ve put up the Antarctic equivalent pic. What gives? And today I read on TVtext that 50, <5 year old kids died of extreme cold in Peru, while the most of south America is in a record cold, including the Amazon, where temperature is 9C instead of the normal 20C or thereabouts. (If my memory serves me well, this cold in the south of South America is the third consecutive winter). And all this happening while Antarctica has a record sea-ice cover, Australia under a continuous cold snap, the Arctic is not melting as it should and Europe is getting back into normal temps. I dont see it at all going good for the warmists. Give it time (five years?) to get back to average. We’re interested in continuing the recovering trend from the low of 2007. I find an interesting coincidence that the arctic air has been bottled up from travelling south. The high pressures around the lower latitudes have been keeping the cold north. Coincidentally I posted a very similar post at my site a couple days earlier. Nice to the see an excellent supplement. 5.5 million sounds too high to me. There’s going to be a big meltoff this week. I think we’ll end up near 5 million. No such map or graph exists from NSIDC, so it would have been difficult to include. Thanks for this resume , very revealing. The two graphs under the heading “GISS thinks it has been hot in the Arctic.” are particularly revealing. I note even areas with data tend to get warmer during the processing. see: Scandinavia, northern Alaska, Nova Scotia. 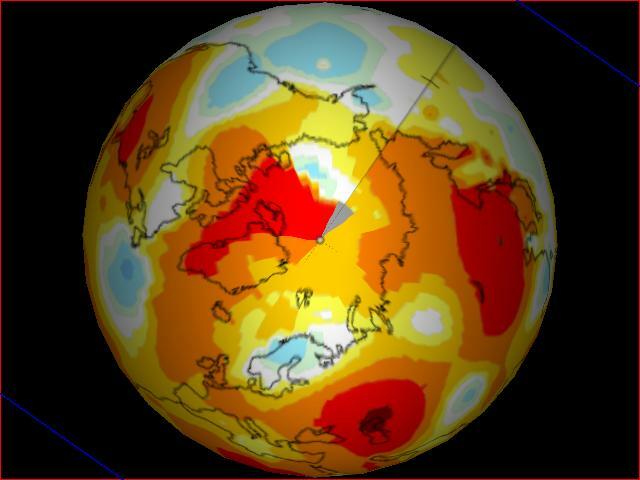 Also the areas with no data around the pole end up hotter (greater anomaly) than the surrounding areas with data! This matches a report I saw here yesterday detailing similarly dubious interpolation in the Sahara, where significant areas without data ended up with greater anomalies than any surrounding data. However, I really would appreciate these graphs being properly sourced. “GISS thinks” is not a reference and they should be complete with title and a legend for the colour scheme. I’m only guessing that these are temp anomalies, and if I want to relate this info to someone else I NEED to have a proper reference for the source of my information. Anthony, could you add this please? The Cyrosphere sea ice concentration is very telling. It is much better than recent years and, along with the very quiet sun, I expect 2010 will end up better than 2009. With Antarctic sea ice at record levels, perhaps the warmers will see this as a global climate reality check? Although perhaps not, as it is clear evidence against their belief. Methinks R Bates must be on holiday. Perhaps he has gone away with ANU to the frozen north. Phil is confusing area with extent. It is normal to have cracks and holes in the ice. This is caused by tensile stresses. What part of this map comparison is it that you are having difficulty understanding? Coldest temperatures in a decade in Argentina. (CNN) — A weeklong cold snap that has killed at least eight people in Argentina is expected to continue Monday, state media reported. Argentina’s National Weather Service says the blustery weather will continue in the nation’s capital of Buenos Aires, with heavy winds, intense rains and frigid temperatures expected, state-run news agency Telam reported. Temperatures dipped below zero degrees Celsius (32 degrees Fahrenheit) in 10 of the country’s provinces Sunday, according to Telam. The news agency reported that at least eight people have died during the cold snap in the past several days. It has also caused flight cancellations and delays at the Buenos Aires airport. Half the country is covered in snow and the capital recorded its lowest temperatures in a decade on Friday, Telam reported. Mercury fell to -1.5 degrees Celsius (29 degrees Fahrenheit) in the capital, close to the coldest temperature ever recorded there. The cold snap is causing record demands on gas and electricity, the Planning Ministry said. It has put restrictions on business and industry use of gas to ensure homes have enough, the agency reported. Nice post Steve. Very informative. But you once again have not included MISOP …MIOMED, …or is it MYOPIC, or whatever the hell it’s called, which clearly models no ice in the Arctic. There. Just thought I could save R Gates some time. I’m ‘implying’ nothing, when Steve makes an incorrect statement like the above I point it out. If you wish to draw an inference from that that Steve is being deceptive that’s your call, you could equally infer that he doesn’t know what he’s talking about. I think that you and others were saying that a slow melt in July was indicated at just the time when ice extent was the lowest on record about 6 weeks ago. Seems that those who are more open-minded seem to be getting closer to the mark in making forward predictions? you want to mislead people. You have challenged Steven G in the past and you have been wrong as you are now. Now how do we count the area, as first year mm ice? What is the probability of its melting again if the sun comes out? I discount air since it has such small heat capacity and is below 2C anyway. unfortunately it is camera 3. 1 and 2 do not exist then, but the optics are similar. Pools gone by middle of August. Geeee! Never knew it was this bad! I’m soory everyone, but I can’t deny the obvious anymore, it’s all right there in B&W and Liv’in Color! We’re doomed! Fat Albert, I’m sorry, “He Who Must Be Believed” was right, I mean left all along. It IS too late! PS: I now suspect that the IPCC, the Club of Rome, and all the other secret elite organizations, associations and clubs, have known every hateful detail of the AGW Climate Change Report for many years and were only trying to prevent mass chaos and rioting. No doubt the Neatherlands and Florida will soon disappear. Panama will sink beneath the waves and the Pacific and Atlantic will be as one. The Gobi will expand and swallow China. India will be racked, or is it wracked, by earthquakes. Everything east of the Andes will be swamped and under 200m of salty, polluted ocean water. Indonesia and the Islands of the Pacific will disappear. Australia will be divided into two desert islands. New Zealand will look like Hawaii. And Hawaii will all but disappear. California, Lousiana, Arkansas, Oklahoma, Kansas, Missouri, South Dakota and Iowa will all disappear. Russia will be a tropical paradise but only open to ‘select’ immigration. And all this will happen in the next 30 years. Wooooo is me! Wooooooooooooooooo is me! I feel here are lots of expert climate scientists. Does anybody know what causes the deceleration of artic ice loss? Any information appreciated. Nothing so far has changed my forecast of 4.5 million sq. km. extent for this year’s melt seaon low, with a new record low of 2.5 million likely to be reached before 2015. Specifically, I see the melt rate picking up here in late July/early August, as the ice that has spread out (causing the extent rate to slow down) begins to melt. If we’d seen a big cold spell hit the Arctic over the past month, I might have a different opinion, but the slow down in extent is not that a cold spell hit and the melt suddenly stopped, but more due to winds and currents spreading it out (hence, slowing down the shrinkage of the extent loss). The above referred SST graph of the Arctic shows quite clearly that the region is experiencing anomalous warmth, and not anomalous cold. Nice short term forecasting but you’re still not giving us any insights into what’s going on long term which I think is more important. I think you might even admit what you’re really describing here is weather not climate. I think the first graph is a little misleading. Willis will give you a slap on the wrist for not starting the axis at 0 and giving us the full perspective, 2010 might look a little less dramatic. Having said all that I think the AGW CO2 explanation for everything to do with climate is missing some major factors. I just wish I knew what they were. Exactly. People making predictions benefit from being correct – so I can’t understand the motivations of people who make obviously incorrect forecasts. One way or another, it is an indication of a defective thought process. Really on what planet does a drop from 6.8058658 Mm^2 to 5.5386882 Mm^2 represent “Cryosphere Today shows that ice extent and concentration is about the same as it was 20 years ago.“, that’s a drop of 21%? You’re right I’ve challenged Steve in the past, and guess what he was wrong about CO2 freezing at the South Pole and phase diagrams and I was right, he misread the situation at Barrow this month and I got it right, to just give two examples! The melt pond you linked to is frozen over. Look closer. 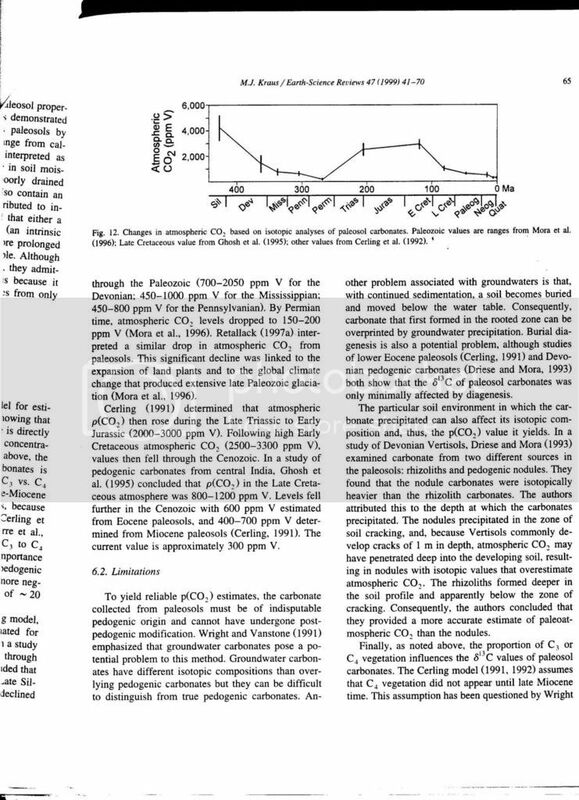 I challenge you to find anything incorrect that I wrote in the CO2 freezing article. Be specific. As far as Barrow goes, you were the one who was incorrect. The ice didn’t break away until July 5. Your were claiming it was gone a week earlier. You were wrong about how to read a phase diagram and persisted in asserting that the pressure axis was total pressure rather than the partial pressure of the compound concerned. This lead you to assert that solid CO2 would be deposited at the S Pole which it can’t in our atmosphere. Don’t believe it. As with religion they will not change their beliefs. Just read R Gates’ comments above: “Nothing so far has changed my forecast of 4.5 million sq. km. extent for this year’s melt seaon low, with a new record low of 2.5 million likely to be reached before 2015.” At least he is not forecasting an ice free Acrtic at that time. That will probably now follow in 2035 or thereabouts. I am still to see a comment from R Gates on the sea ice extent in Antarctica and the Global sea ice extent. Maybe I have missed these. Very selective memory, I told you where the measurement was made which you had mislocated, I told you, contrary to your assertion that there was no change in the fast ice off Barrow, that at the time you made that post the fast ice off Barrow was breaking up and that your estimate of new record late break-up at the official site was likely an overestimate. I pointed out that indications at Barrow on the 4th were that the fast ice to the north was starting to break-up, you continued to deny the possibility which was later confirmed on the Barrow website. Go back and read those posts again, you’re wrong (again). The above referred SST graph of the Arctic shows quite clearly that the region is experiencing anomalous warmth, and not anomalous cold. All that is needed for high SST is a few days of sunshine and low winds. They can be gone just as quickly. Temperatures down a few hundred meters, plus ocean currents e.g. north atlantic drift, are a bigger factor – but less easy to assess remotely from satellites. Exactly what I expected. You didn’t quote anything that I said in the South Pole article. You instead quoted the misinterpretations of that article which other people made. Has anyone done a Fourier transform on the data set? Is there an 8.5 year cycle there? You were quibbling over the exact location where they were measuring the ice at Barrow. Who cares? You were claiming it was gone at least a week too soon. I also enjoy reading the the pro-AGW comments here, because I do want to understand their viewpoint better; particularly in the context of the articles posted on WUWT. Steve’s articles seem to attract the most AGW proponents to them, and thus are some of the most informative comments to read. Phil, you have been here long enough, and I know you are not naive in knowing the difference between sea ice area and extent. You appear to be disingenuous with this comment. You can do better than this. Also, I would like to know where you obtained the CT area data. I briefly looked on their site, and their archives appear to only contain maps. I did not see a numerical historical data base. I would appreciate if you could point me to the data sets. Thanks in advance. As an aside to Steve, thank you for this series. If I could make a suggestion: in your comment replies, some frustration comes through when addressing the pro-AGW comments. I can understand it to a large extent – when you get the volume of comments you do, and many of those comments contain implied or explicit ad-hominem attacks, it is only natural to want to reply in kind. However, your scientific data stands on its own, and any expressed frustration only detracts from it. I would suggest when you reply, that you write the reply, walk away from it for 10 minutes, and then re-read the reply. If the reply contains anything other than your data, delete it. I guess our definition of “frozen over” is a bit different…but no comment about using a July 7 pic? The U.S. National Snow and Ice Data Center, the Colorado-based institute that tracks the annual cycle of winter ice buildup and summer thaw, says in its latest report that June’s rapid melt — which followed a similar record-setting retreat in May — means the polar ice cover remained on pace to shrink more than it did in 2007, when an unprecedented loss of ice first prompted scientists to raise alarms about the Arctic as a harbinger of global climate change. When there is ice on the surface of the water, it is a pretty good indication that the ice underneath is not melting. Phil could have expressed his point better but he does have one. If the extent and concentration were the same now as at the same time in 1990 it would follow logically that the area would also have to be the same, since area = extent x concentration. Admittedly, “the same” is different from “about the same” but, assuming Phil’s area numbers are correct (and I second the request to know where he got them), the area is about 19% lower than for the same time in 1990., which strikes me as a significant enough difference somewhere in the combination of extent and concentration that I wouldn’t want to have to defend calling it “about the same”. “As with religion they will not change their beliefs. Just read R Gates’ comments above: “Nothing so far has changed my forecast of 4.5 million sq. km. extent for this year’s melt seaon low, with a new record low of 2.5 million likely to be reached before 2015.” At least he is not forecasting an ice free Acrtic at that time. That will probably now follow in 2035 or thereabouts. I am still to see a comment from R Gates on the sea ice extent in Antarctica and the Global sea ice extent. Maybe I have missed these. John, you might be new here, but I posted extensively about Antarctic sea ice and global sea ice in past posts. As a short course, GCM’s have long shown that the Arctic would be more severely affected by AGW than the Antarctic and there are many very good reasons for this, not the least of which is the huge heat sink the is the southern ocean, but added to that is the very different environments and dynamical systems they are. Antarctica is a frozen continenent surrounded by water, with sea ice forming every year in that water. The Arctic is an ocean surrounded by mainly ice free land (the exception being Greenland). Those who point to Antarctica as “proof” that AGW is not happening truly do not know of what they speak. 2) The fact that even during a long and deep solar minimum of 2008-2009 with a La Nina added in for good measure, the Arctic Sea ice could not recover in any meaningful way. Yes, 2008 & 2009 showed some slight uptick from the very low year of 2007, but these would hardly be classified as recoveries by any expert. Arctic SST’s and air temps have shown warm anomalies for many months. I’ve been talking about them since at least Jan-Feb. when all the AGW skeptics were crowing about the snow in Florida as proof of that AGW is wrong, I was pointing out the actual causes of that cold air in Florida…which was the high pressure systems parked over N. Canada and Greenland, bringing them warm temps and pushing the cold air south…to cause the snow in Florida. Whatever the term”Arctic interior” means, and I’m not aware of a precise definition, Phil’s data and therefore my point were not specific to the Arctic interior but related to all the northern hemisphere sea ice so it escapes me why you’re addressing that comment to me. If you think your observation has some bearing on whether your statement “Cryosphere Today shows that ice extent and concentration is about the same as it was 20 years ago.” is compatible with the data on sea ice area Phil offered, please explain how. I don’t know of any global climate modesl that use only the increases in CO2 and other greenhouse gases as an explanation for “everything to do with climate”. I think some AGW skeptics would do well to study the actual global climate models to at least understand what factors they do look at when making longer range forecasts. These models are far from perfect (as we all know) but they are far more sophisticated then some skeptics might like to give them credit for being. He is limiting his statement to the data source of Cryosphere Today, in particular their compare tool in which pictures tell the story. I tire of those who are rooting for the demise of Arctic Sea Ice, all in an effort to “prove” and validate their belief in AGW, by means of playing the “gotcha” game with every statement Steven makes. IMO you all seem rather petty and pathetic. Yes I have been here long enough to know that Area=Extent*concentration (see other post quoted below), apparently Steve has not! Phil could have expressed his point better but he does have one. If the extent and concentration were the same now as at the same time in 1990 it would follow logically that the area would also have to be the same, since area = extent x concentration. Precisely and Steve and AAM have been around here long enough to know that. Admittedly, “the same” is different from “about the same” but, assuming Phil’s area numbers are correct (and I second the request to know where he got them), the area is about 19% lower than for the same time in 1990., which strikes me as a significant enough difference somewhere in the combination of extent and concentration that I wouldn’t want to have to defend calling it “about the same”. As I posted above I make it 21% but the point still stands. Despite the date range in the title it is maintained up to date. R. Gates, one is either a skeptic regarding a hypothesis, or one is not. No percentages are involved, just as no one is 25% pregnant. Someone is either 100% skeptic, or 0%. The only honest scientists are skeptical scientists, first, last and always. The rest have sold their souls. Good grief man are you so bound up in your own propaganda that you can’t honestly face up to your mistakes? How cold is it in Antarctica? According to Weather Underground, Vostok, Antarctica is forecast to reach -113F on Friday. That is four degrees below the freezing point of CO2 and would cause dry (CO2) ice to freeze directly out of the air. We have a number of posters here boldly proving that according to their misinterpretation of how phase diagrams work, polar ice caps can’t exist on earth. Look at the phase diagram for water. Water vapor partial pressure near the poles is close to zero during the winter. Using the brilliant interpretation of Phil et al, the freezing point of water in Antarctica and the Arctic would be close to -70C, and there could be no ice. The reason why water freezes at 273C is because of the atmospheric pressure of 1KPa, not because of the partial pressure of water – which is much lower, and varies hugely from the poles to the tropics. The freezing point of water (and CO2) is fixed by the atmospheric pressure – not the partial pressure. Likewise, the boiling point of water is fixed by the atmospheric pressure and is independent of the humidity or partial pressure of water in the air. Does Phil also believe that water boils at room temperature on earth, due to the low partial pressure of water? So where did I misrepresent your erroneous arguments in that thread? 2-D Phase diagrams refer to atmospheric or ambient pressure, not vapor pressure or partial pressure. Why don’t you censor yourself instead of spreading nonsense? Just how am I quoting “the misinterpretations of that article which other people made”, you said it, you were wrong, face up to it! Like R. Gates, I would rate myself as a 75%+ believer in Anthropogenic Global Warming, and the cheering is a mite premature, gentlemen. (1) University of Bremen Arctic ROOS shows the ice extent in July to be the second lowest ever (2007 being the lowest). (2) PIPS? How old? Well, say no more. 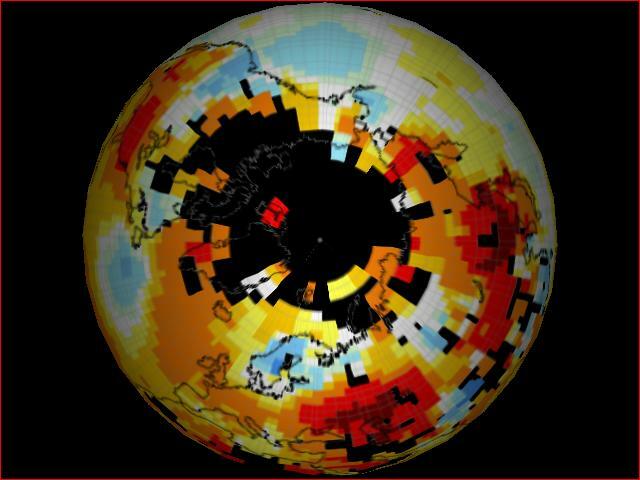 (3) Cryosphere Comparative maps? I stopped believing in these some time ago. The site calls them “Older Products”, which suggest to me they are no longer supported. The present day map shows much higher ice concentration than the current daily map. (4) Global ice Extent? Well, there are two processes here – one (Arctic) is consistently below average, the other (Antarctic) consistently above. Hmm, suggests to me two different processes. Which of course is the case, Antarctica being most land ice, so the information to be gained by a simple addition is questionable. (5) Ice blogger Neven shows a large crack opening where Steve sees melt pools freezing over. All in all, 2010 is not yet over. There is a lot to wait and see about. Perhaps this time next year we will be looking at CryoSat-2 data. Everything you post indicates that you are 100% convinced of the validity of AGW and yet you regularly rate it down to 75% either as a subconcious form of submission or more likely as a comfort blanket or fig leave to cover your underlying doubts about the suitability of the Emperor’s apparel. Lowest ever?? Can’t you see how ridiculous that statement is? 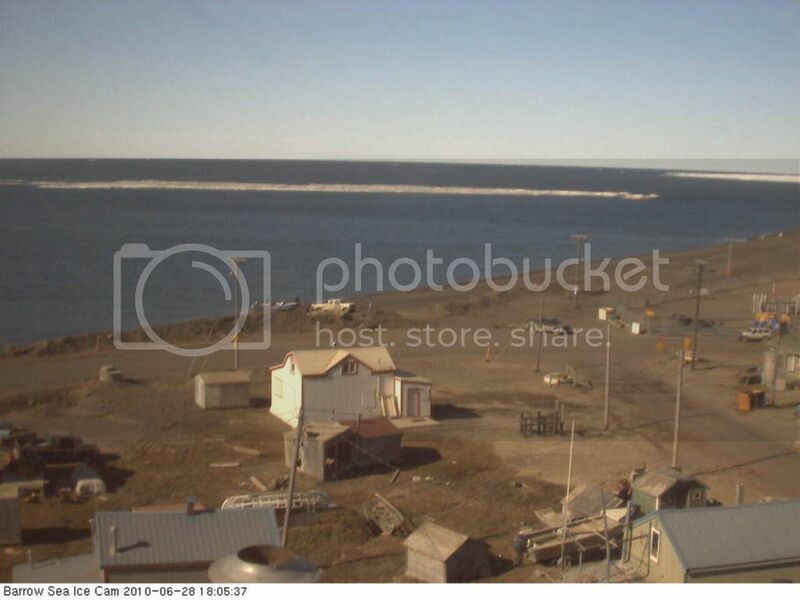 Latest Barrow Ice Breakup On Record? 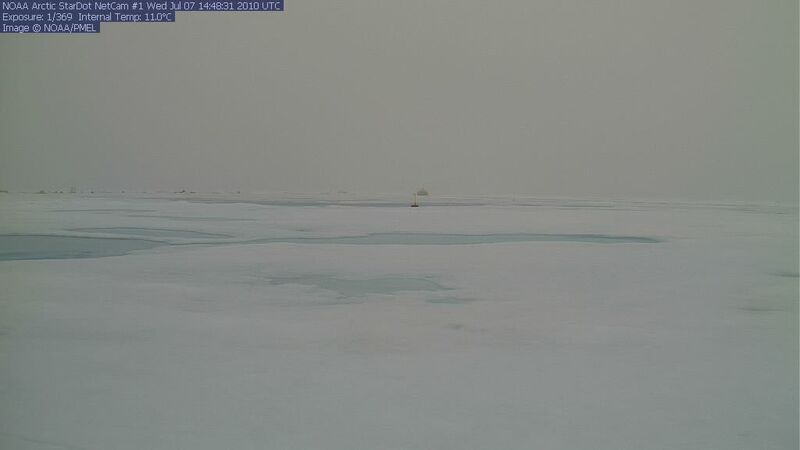 Fortunately for Steve the Barrow site was down over the weekend otherwise his comments would have almost immediately contradicted since the fast ice at Barrow broke up over the weekend. 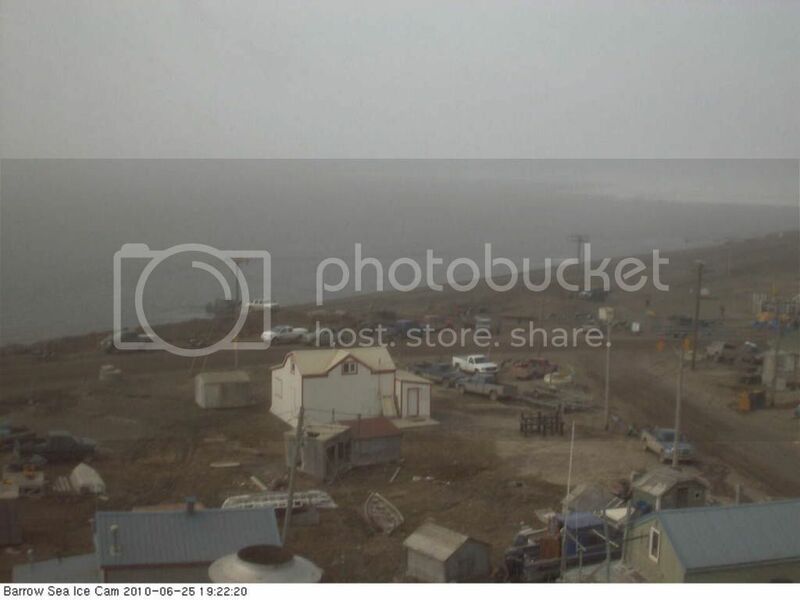 As I mentioned just before the site went down it was showing ice free off the beach (25th at 19:22) with a boat in close to shore, in the fog the only ice visible is to the northeast. Contrary to Steve’s claim that nothing was happening to the ice if you look at the radar over the last few days you can see small pieces breaking off until about the morning of the 25th when it totally disintegrated and blew offshore. Steve expects the fast ice to the northeast to hang around for another two weeks, doesn’t seem very likely. And guess what, it didn’t last past the 4th. Phil’s area data was also sourced to Cryosphere Today – “According to CT on this date in 1990 the area was: 6.8058658 Mm^2 whereas now it is: 5.5386882 Mm^2”. If you want to claim the CT maps are good but their numerical data is bad, be my guest. I have more faith in their published numerical data than in anyone’s ability to eyeball the comparison maps and determine how two dates differ. Argentine gas supplies are being reduced this month as demand increased during a polar front that brought snow to 12 of the country’s 23 provinces and pushed temperatures below those of Antarctica. Temperatures in Mendoza, the wine-producing region in western Argentina, fell as low as -8.9 degrees Celsius (16 degrees Fahrenheit) on July 15. So stock up on those pre-2004 Argentine Reds, as the vintage is going to be a bit cold challenged for a while. You do understand the difference between the freezing point and the dew point? Think H2O. Ice freezes directly out of the air below the freezing point, but doesn’t accumulate until below the dew point. The freezing point is not affected by the partial pressure. Above the dew point, sublimation occurs as fast as freezing. I’m sorry that you have had difficulty understanding this. I sure hope you are wrong. Just give some of that old-time global warming! Yes that crack has been there for a month or so as animations showed the small buoy moving laterally compared with the larger one and indications on the surface of a crack. As of this morning the crack appears to be widening as you point out. 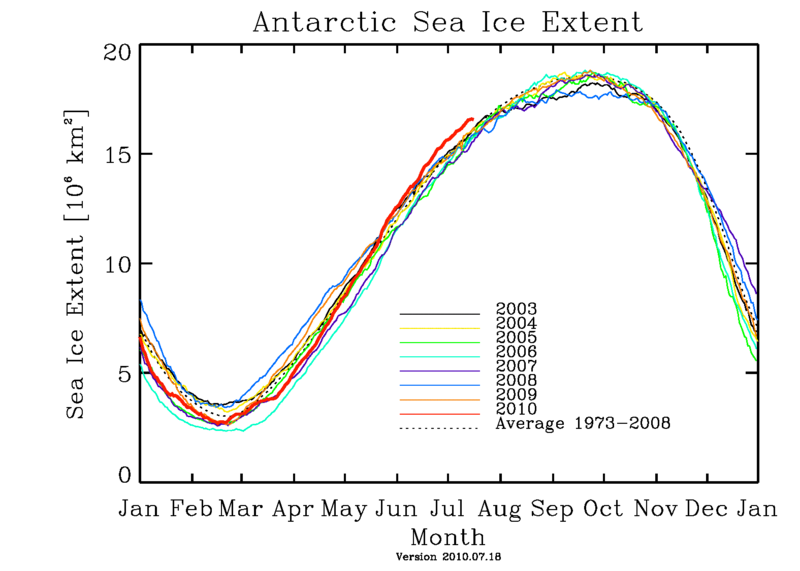 so even when you look at actual ice extent you can tell that 2010 has less ice than 1990. I make no claims other than the ridiculous nature of people to play gotcha games with people’s statements rather than trying to contribute information for all of us to share. It breaks up the flow of those of us that are trying to learn and hear a fair representation from BOTH sides. The only thing that Phil and now you seem to contribute is contention and accusations. I’ll pass on further posts from the both of you. R. Gates and Anu keep up with your counter posts I find them informative and a good presentation of the other side, even if R Gates is stubborn as heck! We then got a bonus of a video clip that I think was presented by Gary Sharp. It showed the heat / cold cycling of water in the pacific over decades as El Niño comes and goes. How to put a movie into words? Not well… But you see the warm and cold moving and swirling and you start to see patterns, one is that it drifts north over time. Things are shaping up pretty much along the lines predicted by several folks for a very very cold 2014-2040 time period. Not the type to be bashful about making clear predictions (no wussy “projections” for this man!) he stated flat out the “New Little Ice Age begins in 2014.” Though with various lags from things such as ocean heat content and climate cooling rates, the depth if the NLIA is not reached until 2042 +/- 11 years for the solar minimum and then 2065 +/- 11 years for the temperature minimum. There were several charts of correlation of fit between the solar output, long term weather changes, and the Maunder, Dalton, etc. solar minimums and cold periods. And the correlation with the solar system barycenter to sun position AND with cosmic ray intensity. A wavelet squared transform was used to predict the solar output going forward and found a roughly 120 year period. The expectation, for a 120 year period, results in “solar secular minimums” in 2030-2040 and 2160-2170. The 2010 drop in solar output ought to continue for about 60 – 80 years. So it looks like we have about 30 years of darned cold in front of us, and the present cooling is not even a hint of what’s to come, as the cold ocean impact has not yet joined the cold air up at the Arctic. But yes, I’d really really like to be wrong on this one. I don’t like the idea of living through our own New Little Ice Age. Yet we’ve got a couple of Ph.D. types doing analysis from differing directions on different data reaching similar conclusions; and we’ve got the “facts on the ground” with recent snow patterns (much more, and in ‘warmer’ places than expected) along with a stubbornly sleepy sun. As of today, it looks like the polar temperature has dropped to 273.15 K.
The last time I took high school chemistry, it was hard for ice to keep melting at that temp. Your loss, you’ll have to put up with Steve’s errors without correction, if he didn’t make so many silly mistakes and instead of correcting them, defend them to the death there would be no need to disrupt your reading. Your apparent inability to acknowledge that Phil did contribute information in the form of data on the northern hemisphere sea ice area in 1990 versus 2010 doesn’t suggest to me that you’re interested in giving both sides of arguments here a fair hearing. If your mind is already that closed, your threat to ignore anything Phil and I write in future strikes me as rather empty. So go ahead and add us to your personal kill file. Julienne too, I suppose, since she also has the temerity to offer data showing that the extent is lower now than at the same time in 1990. Yes I do, unfortunately you have failed to learn anything in the last year since you last posted your erroneous beliefs on the subject. No it doesn’t, ice is deposited directly out of the air below the triple point. but doesn’t accumulate until below the dew point. The freezing point is not affected by the partial pressure. Above the dew point, sublimation occurs as fast as freezing. More nonsense, the dew point is the temperature at which a horizontal line drawn through the atmospheric water vapor pressure intersects the cyan/yellow line on the diagram. At temperatures below that point water will condense. If the water vapor pressure is below 0.006 atm it is termed a sublimation point and if the temperature falls below that value ice will deposit. I have no problem understanding the subject, your stubborn refusal to learn about it and your persistent propagation of mis-statements on the subject does puzzle me though. In all fairness, Steven, why don’t you just admit that you didn’t see that the image from webcam #1 hasn’t been updated since July 7th (I didn’t notice it either until now) and have it over with? It’s no big deal, certainly not worth dodging questions for. Yep, inconvenient July for you. As the new AQUA channel 5 chart shows, July has been at or near record high levels all month long. increasing water vapor concentrations” – he uses radiative transfer codes like Miskolczi. R Gates. tsk tsk. The cooling of the stratosphere is overwhelmingly Solar related. CO2, if enough of it is up there to act as more than an insignificant coolant (and there is no data to say it is or whether or not its percentage has changed), acts as an additional insignificant coolant that is probably well within the cyclical solar caused temperature noise. You also cannot relate the contention that the rise of CO2 to stratospheric cooling to a confirmatory mode of global warming, since its presence there does not affect our temperature. Very weak point and easily counterpointed. SSTs are a shifting mosaic giving scope for selectivity. On a wider scale there has been a trend of a receding tail of warm surface water in the Atlantic from the dying el Nino, and a more pronounced reversal to surface cooling in the Pacific. There is an interesting tension between a PDO well into negative phase against an AMO near the end of a generally positive phase, giving some sporadic warm holdouts in the Atlantic; however within a few years the AMO will join the PDO in negative territory. And Bob Tisdales website and analysis show OHC in the Atlantic to have been on a downward slope for a number of years. I feel that the analysis of Tsonis to be pesuasive with emphasis on a kind of nonlinear “regime change” triggered by ocean cycle phase synchrony. This could correspond with Abdussamatov’s 2014 NLIA, after which we may find ourselves in EM Smith territory. Better find some jars for pickling fruit and veg. O and BTW the AMSE site shows Arctic temps heading stubbornly lower despite those SSTs. By the way, I’m still hoping to get an answer to the link I posted on another thread whereby I asked how come we have been warming since 1690 (not 1880) prior to enhanced man made Co2? Vuk also posted a very good question to you. Dirk H, July 19, 3:14 pm. Indeed, water vapour, clouds and the hydrological cycle supplanted CO2 as climate controller 500 MYA. The global ice ages of the precambrian (snowball earth with CO2 at several thousand ppm) provided the silicate weathering and eventually soils that set the stage after the Cambrian eukaryotic explosion for the Ordovician-Silurian evolution and spread of macroflora and large trees in particular, creating the humic soils and forests to retain water on land and make the hydrological cycle dominant in climate. Complete with negative feedbacks for stability and insensitivity to CO2. Trees killed CAGW, think on that R Gates, Phil, Julienne, next time you’re out together tree-hugging. Funny you should bring that up. It is generally accepted that there is 2-3 month delay in the atmospheric temperature response to the ENSO cycle. 2-3 months after an El Nino fades away, we can expect AMSU temps to start cooling. The latest El Nino collapsed as we went from April to May. Therefore, we would expect to see those satellite temperatures to start cooling mid-July, not before! Yesterday was the first day all year that the AMSU temperature fell below the temperature line from last year, and the cooling in recent days has been rather abrupt, much like the demise of the El Nino. 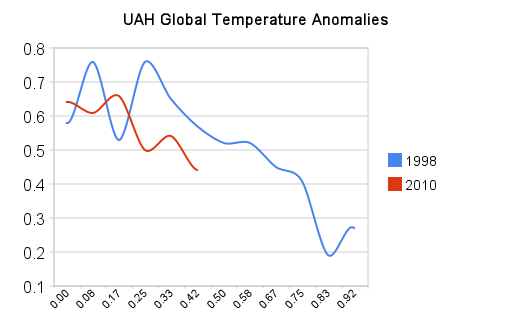 I think it is a pretty safe bet to say that UHA AMSU temperatures will continue to cool and that the rest of the year will likely be below last years temperature line. In fact, I wouldn’t be surprised if the average temperature for 2010 ended up below the average temperature for 2009, but I wouldn’t put money on it just yet. Is there a reason why the still on record level concentration data was dropped? Yeah, enough to drown a kitten. Truly sorry I missed that. Which tread was it? I’ll be glad to go have a look. In terms of temps rising since 1690, I don’t know what specfic data you’re looking at but my knowledge of the data is that after the MWP, temperatures generally declined until the end of the Maunder Minimum in 1715. They started rising gradually with a bump down from 1790 to 1830 or so during the Dalton Minimum and then started rising again gradually, but really took off at the beginning of the 20th century. After factoring out solar cycles, and the the shorter term oscillations of ENSO, etc. the longer term signal seems to be CO2. If you know of something else that acts on the climate over a centuries, such as the steady accumulation of CO2, my skeptical side would love to know more about it. Of course the Milankovitch cycles happen over much longer periods, and so CO2 forcing fits in that longer gap between Milankovtich cycles on one end and solar cycles, ENSO etc. on the other. My point is that it is happening and it was predicted to happen by GCM’s when factoring in the increase in GHG’s. Of course it is not proof, but is one additional data to help tip the scale in my estimation. For example, if it wasn’t happening, AGW models would be hard pressed to give an explanation as it is not a side-effect or minor effect, but a prime and principal effect of increased CO2 levels. Thank your for that, Julienne. It’s nice to have a true expert step in and keep the facts accurate. There you go again with that false “if we don’t know what causes natural cycles, then it must be CO2” Argumentum ad Ignorantuim. The fact that we have not verified the mediator of gravity does not negate the effect of gravity. For at least the past 420 million years rises in CO2 have always followed temperature rises; never vice-versa. Therefore, rising CO2 is an effect of rising temperature, not a cause. And CO2 levels have been much higher in the geologic past — while the planet descended into a long Ice Age. What happened to carbon’s heating power?? My good friend Smokey, using percentages to predict the probability that something is or isn’t true is the hallmark of the scientific process. More and more data only increases of decreases the probability of something. Curiosity, not skepticism is the hallmark of science. I am skeptical of any explanation for events occurring in the natural world until I begin to acquire knowledge of more data that either proves or disproves that explanation. Regarding any specific theory, such as AGW, before I knew anything about it at all, I would be 100% skeptical, as I would as yet have no basis for being anything else. As I have access to more and more information, that percentage will either stay at 100% or decrease, depending on the nature of the data. Also, regarding any specific theory, I personally would never drop my skepticism to less than 5%, so as to make certain my mind stays open to other possibilities. Curiosity is the hallmark of the science, with skepticism being a tool that is adjusted up or down to each specific theory based on data that seems to supports or refute the theory. R, you know too little of the scientific method and skepticism. 25% skeptic? Either you’re a skeptic or you’re not. It’s either/or, see? Skeptics say, “show me.” And, “may I have a copy of your code?” When they’re stonewalled it tells you the globaloney promoters have traded in their scientific ethics. For the past twelve years Michael Mann has stonewalled data requests. So much for the Scientific Method. R Gates. tsk tsk. The cooling of the stratosphere is overwhelmingly Solar related. OK Pamela, kindly explain how? CO2, if enough of it is up there to act as more than an insignificant coolant (and there is no data to say it is or whether or not its percentage has changed), acts as an additional insignificant coolant that is probably well within the cyclical solar caused temperature noise. So what are the significant radiative coolants up there in your opinion? I’ll await your justification with interest. I’m looking at areas of potentially perennial ice in the Arctic interior. There appears to be more ice there in 2010 than 1990 in the UIUC maps. That’s not the way the universe works Smokey. At the most fundamental quantum level, things are not black and white, but intermingled fields of probabilities. This drove Einstein crazy, but you’re not Einstein, so don’t let it bother you. I can be 25% skeptical about AGW, and thus 75% convinced it’s really happening. It’s really quite in keeping with the true spirit of the way the universe works at the most basic of levels. Black/white, yes/no thinking makes things nice and neat but the universe is far more messy than that. An individual molecule has absolutely no knowledge of vapour pressure. Molecules freeze below the freezing point. The dew point is where sublimation is equal to freezing. Vapour pressure is a statistical concept, and has no impact on the behaviour of individual molecules. The fact that you don’t understand something does not make someone else a “liar.” You lack both education and manners. Gates, don’t speak for the universe. You’re either pregnant or you’re not. Either/or, see? Same for being a skeptic. You’re either skeptical of unproven assertions until convincing physical evidence is provided, or you’ve drunk the CAGW Kool Aid, and your ‘evidence’ comes out of a computer climate model. Nothing can be ‘proven’ as such outside mathematics or logic, which each require unproven assumptions or axioms to begin with. Thus, you can remain sceptical of – for example – quantum mechanics, but operate as if it is true. I and others term this ‘provisional acceptance’. This means that you accept it due to the overwhelming preponderance of evidence in its favour and operate as if it is true, with the understanding that it is possible for it to be demostrated as likely false at any moment. This means that you are not 100 per cent certain – you cannot be, as such certainty is beyond both deductive and inductive reasoning, the only two kinds of reasoning that we have. Re CAGW, I provisionally accept it, which means that I operate as if it is true while understanding that it could be overturned at any moment. I am probably not with R Gates on his 75/25 percentages, or even his never going lower than 5 per cent. Indeed, accepting something ‘100 per cent’ – whatever that means – is not something that I really understand, either. At a functional level, I operate as though I accept a multitude of theories 100 per cent (I do not throw myself out of one out of every 100 tall buildings I come across, for example). But I still accept that the theory of gravity will in all likelihood be modified in the future. Likewise with CAGW. So in a sense you are correct: either you operate as if proposition X is true or you operate as if proposition Y is false (100%/0%). But looking at that in a binary way does not do justice to how people mentally operate, which in my case is ‘if the evidence for proposition X seems strong enough to me, provisionally accept it’. I understand it perfectly, your nonsense I find difficult to understand, you lied about what you said in the thread on ‘CO2 freezing’ a year ago, you’ve proved it here today. The education that is lacking is yours, read a basic undergraduate text on the subject and spare us all your rubbish. My education is certainly not lacking, I’ve even taught this subject at the graduate level. Your rudeness and arrogance about subjects you know nothing is annoying and it’s about time you took another hiatus like last year when you embarrassed yourself on this same subject. 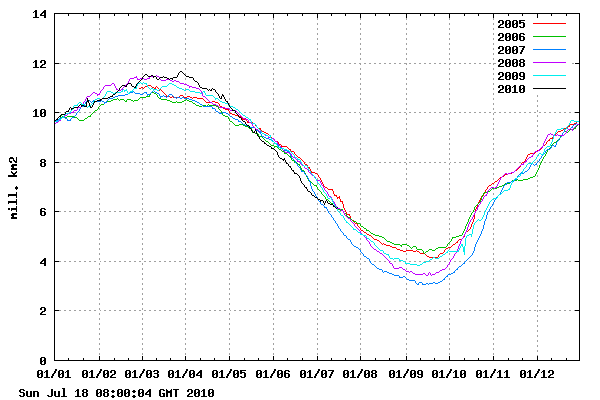 Looks like DMI polar temperature has touched zero C, a month ahead of schedule. CO2 is a greenhouse gas and as such increasing its level in the atmosphere will increase temperature (all other things being equal). The fact that CO2 is not the only climate forcing does not mean it has no effect. Rising temperatures (lets say due to orbital forcing ending a glacial period) cause CO2 to release which in turn causes temperatures to increase further. The two effects are coupled. Which then, in turn, means that you will do exactly what, in regard to how you “operate” in life? Well, Billiard Balls seem to have approximately the same amount of functional thinking…and fate. Except that Billiard Balls don’t have to obey the “Precautionary Principle”, so at least they are allowed to move. Phil., at the Blackboard, insinuates about the UAH record instead of proving his point, and wants to claim moral high ground here? Fah! We’ve had 3 big melt days in a row since this this thread first began, with each day bigger than the one before. The last two weeks of July could turn the title of this thread back on us. It’s not a repeat of 2007 but the lower predictions that have been made on this blog are starting to look more informed. I have taken and will continue to take steps to reduce my emissions of CO2. I push others to vote for parties and policies that will reduce emissions of CO2. I write submissions to government on the issue. And so on. I am not sure what point you are making re billiard balls. My actions are caused by my thoughts/feelings/beliefs, as I am sure is true for all people. Presumably as you passed no comment on my great Lakes link you accept that the ice levels wax and wane over the decades? As regards the comment you missed, both my commnt and that of Vuk are towards the end of this one. I have previously cited other instrumental records and contemporary observations relatng to the period. !715 was in the middle of a warm period that was, at its peak decade in 1730, only some 0.6C cooler than todays (dubious) values. “We are seeing a number of interesting polar ice milestones this month. First, WUWT now has a new permanent Sea Ice Page, where you can find all of the live graphs and images in one place. Details here. I have some difficulty with the last sentence above. The bar graph shows sea ice extent and without including sea ice volume, one cannot use the simple word melt. While the sentence opens with “ice extent” it then says “total ice loss”, which would be more clearly expressed using “total ice extent loss”. The article is therefore misleading to the casual reader. Unless we know starting volume and compare it with volume a certain later date, we cannot claim to know an amount of melt. It is possible, if not likely, that depending on the state of the ice, including thickness, the ice extent may slow down if thin ice has melted and thicker ice encountered. I don’t think it is helpful to take a 2 week period of a slow melt of one year and comparing with another. These events are not synchronised and to prove the point, let’s take a four week period, adding 18 to 30 June. Total measured ice extent decline 18 June to 17 July. 2003-1.97 msk (million square kilometres. Hence, for this 60 day period, 2010 trails 2009 by 310,000 sk and 2008 by 160,000 sk. A few 100k+ melt days will wipe out such differences. I won’t bother to include the May melt, the “record low” would vanish. If I count the unrivised 19 July figure as 100K, then both 2009 and 2010 will have had 10 100K+ melt days. 2009 had another 5 such days, sequentially, between 21-25 July. From 17 July, the ice extent in 2009 declined by 2.8 msk at a rate of 50,000 sk/day. Let’s assume that the remainder of the 2010 melt season melts at an average of 60,000 sk/day then assuming another 56 days, the total extent loss would be 3.3 msk. Take that of todays figure of 7.77 msk and the end figure would be 4.47 msk, only just above the 2007 record. The weather, wind, warming water and currents will determine the outcome. The headline “Sea Ice News #14 – an inconvenient July” may well become an inconvenient/convenient one for the remainder of July and August/September. The claim that “everything observed today has happened many times over in the past” (in relation to climate) can be shown to be false by the observed levels of man-made CO2 in the atmosphere, and this phenomenon has not occurred in the past. Therefore, since the premise of the argument is false, the conclusion: “there is no reason to think this isn’t simply natural climate variability at work” must also be false. If people ‘mentally operate’ in such a way that they jettison the Scientific Method in favor of true belief, then nothing will help them unless the scales fall from their eyes and they see the world as it is, not as they fear it might be. Nothing can help a person who plays word games like that. The amount of CO2 emitted by human activity is minuscule compared with the natural emissions of the planet — which are due to warming since the LIA; rises in CO2 follow rises in temperature, therefore thay can not be the cause of any increased temperature. And for those who know better, CO2 levels have been much higher in the past [click on chart to embiggen]; about one molecule from human activity out of every 34 molecules emitted in total by the planet. The assumption by the true believer contingent is that there is something magic about human emitted CO2, which will cause runaway global warming and thermogeddon — while naturally emitted CO2, at a 34 times higher level, is benign and won’t cause a problem. Only the evil CO2 from people is bad. Sounds silly, doesn’t it? And it is. But that’s what some folks actually believe. It’s no crazier than some other religious beliefs, is it? You are completely out of control. The Arctic is behaving exactly as I forecast, and you seem to be having difficulty coping with the fact that WUWT has made the most accurate Arctic forecast – three years in a row. … the Arctic is behaving as NOBODY FORECAST. You said a “recovery” from 2009. That’s NOT what has been happenning ! — unless you want to pick out particular days. –2010 is back up to #2 — & dropping like a Stone – – Today. A New Soap Opera Tomorrow. Even Wayne Davidson missed the El Nino being a “lingering” Modoki type — at some Point, the La Nina OPEN SKIES will take over (& I do not mean this mini-clearing). SUN = MEGA-MELT. When ??? PIOMAS Update – – 31 days & no update. Steven, it is evident that you’ve lost the argument and are now sidetracking with a claim of accurate forecasting, entirely divorced from the issue under discussion. The same applies to just one of Phil’s rebuttals of your statements such as; “An individual molecule has absolutely no knowledge of vapour pressure. Molecules freeze below the freezing point. The dew point is where sublimation is equal to freezing.” Phil is right by calling it rubbish. I sense that on this issue you have painted yourself into a corner. A simple admittance of being wrong would have saved you a lot of trouble. Not doing so carries an occupational hazard, such as going out of control, completely. As for forecasting, would that relate to sea ice extent recovering in 2008/2009, followed by the claim that the arctic had recovered? Where is the third year by the way? Have you anticipated 2010? 2007-4.25 m/sq/km (record low), 2008 4.7 m/sq/km (part recovery 1), 2009 5.24 m/sq/km (part recovery 2), 2010 no recovery? On the other hand, did you by any chance predict the 2007 minimum? That would make the 3 year prediction. Good grief, some ridiculous discussion about the meaning or not of 100% and mixing it with belief? Talk about word games. To R Gates, give up please, don’t waste your time, after all none so blind as those who don’t want to see, I’m a just less than 100% person too, it makes sense. It is now 20 July, the ice area according to Nansen is the same as in 2008 and 2009, so just enjoy the summer, and in September we will see if the minimum extend is 5.5 or 4.5 million square km. And show the same class as Flanagan did last year, who stayed polite to the bitter end, and then quietly left. I see David does not understand scientific skepticism either. “It’s a kind of scientific integrity, a principle of scientific thought that corresponds to a kind of utter honesty – a kind of leaning over backwards. For example, if you’re doing an experiment, you should report everything that you think might make it invalid – not only what you think is right about it; other causes that could possibly explain your results, and things you thought of that you’ve eliminated by some other experiment, and how they worked – to make sure the other fellow can tell they have been eliminated. “Details that could throw doubt on your interpretation must be given, if you know them. You must do the best you can – if you know anything at all wrong, or possibly wrong – to explain it. If you make a theory, for example, and advertise it, or put it out, then you must also put down all the facts that disagree with it, as well as those that agree with it. “There is also a more subtle problem. When you have put a lot of ideas together to make an elaborate theory, you want to make sure, when explaining what it fits, that those things it fits are not just the things that gave you the idea for the theory; but that the finished theory makes something else come out right, in addition. CAGW does not agree with any testable experiment. Therefore it is wrong. And on all time scales, a rise in CO2 follows a rise in temperature. Effect can not precede cause. As an example of scientific charlatanism: Michael Mann has stonewalled giving his information to others for twelve years by using one prevaricating, mendacious excuse after another. Why? Because if he shares his data and methodologies, he knows that everything from MBH98 onward will be falsified for the whole world to see. As it stands, his Hokey Stick was broken by McIntyre and McKittrick, who showed conclusively that if even one tree out of over a hundred Mann used had a hockey stick shape, Mann’s algorithm would always produce a hockey stick shape on the resulting graph — even if every other tree showed a reverse hockey stick shape that angled downward! That is the kind of scientific misconduct that happens when a scientist isn’t 100% skeptic. You can’t be 25% skeptic, or 25% pregnant. It’s all or nothing. Playing both sides like that is not science; every honest scientist is a skeptic first, last and always. The others like Michael Mann are just pushing an agenda. While I am just an armchair teacher, I have taught basic atmospheric science at the middle school level to some very bright but emotionally different students. Here is what I know. There are several interesting things about the stratosphere, including that it heats up with increasing altitude, which stabilizes this gradient (the opposite of the thermosphere, which wants to overturn). Why does it heat up? The major cause is UV absorption. Ozone absorbs more ultraviolet radiation than do the other gasses that make up our air. Ozone lives in the stratosphere. As a result, the stratosphere is heated, and air gradually increases in temperature to the top of the layer, called the startopause. So Phil, what does the Sun do during minimum in terms of UV? 1. Ultraviolet irradiance (EUV) varies by some 1.5 percent from solar maximum to minimum. 2. Energy changes in the UV wavelengths involved in production and loss of ozone have atmospheric effects. 3. The 30 hPa atmospheric pressure level has changed height in phase with solar activity during the last 4 solar cycles. 4. UV irradiance increase causes higher ozone production, leading to stratospheric heating, while decreases lead to stratospheric cooling. And because the stratosphere is not well mixed due to lack of turbulance, gasses layer themselves according to weight. CO2 is quite heavy and would be near the bottom, which seems to me would allow the Sun to do its heating and cooling UV magic unimpeded by CO2 in the stratosphere. David, you will notice that Smokey’s response does not deal in any way with your wholly legitimate statement about provisional acceptance of evidence, which is of course the scientific method in practice. Instead, Smokey talks about something of his own making unrelated to your claim. The technical term for this logical fallacy is “straw man” and it would be interesting to see whether Smokey makes a habit of peddling this fallacy. Let’s see. Yep. Looks like he does, I, of course, referred to “observed levels” of man-made CO2 in the atmosphere, that is, the long-term build-up of CO2, while Smokey refers to levels of emissions. Different measures. Well, I guess twice is not a habit, but as they say, three times or more and you’re playing with it, so watch this space. I’ll respond more fully later when I have more time, for now though I’d suggest that you look up the distribution of O3 and CO2 with height, the definition and extent of the homosphere, and consider why your suggested stratosphere doesn’t continue heating ad infinitum, i.e. what is its cooling mechanism? Are you arguing that [CO2] hasn’t been higher than ~380ppm in the past, or that man-emitted CO2 somehow magically reacts differently than naturally occurring [CO2]? Either way, your logic is transparently false. There have not been very many measurements of CO2 in the stratosphere. Nor do we have any kind of a long term record. What has been measured so far shows that CO2 does not have a very regular height within the stratosphere (thicker in some areas, thinner in others) but it definitely decreases with increasing stratospheric height, an observation fully expected. There is also a night/day change of temp in the stratosphere that can easily be seen as Ozone waxes and wanes over the same period in concert with UV absorption as the Earth rotates. So mathematically, the day/night noise is there, overlayed by the solar cycle, especially significant with high TSI related UV maximums and low TSI related UV minimums. Finally, none of this significantly affects our temps in the thermosphere. FYI: I am familiar with both the ionosphere (the total depth at which the Sun is capable of ionizing our atmosphere), as well as the homo- and heterosphere, having to do with mixing of gasses. “The claim that “everything observed today has happened many times over in the past” (in relation to climate) can be shown to be false by the observed levels of man-made CO2 in the atmosphere, and this phenomenon has not occurred in the past. IOW, if A is false and B is false, the premise “From A follows B” is not contradicted. If A is false and B is true, it is equally not contradicted. If A is true but B is false, it IS contradicted. If A and B are both true, it is not contradicted. What you had in mind was equality; not logical implication. Brendan H is not known for logical consistency. It went right over his head that I was specifically responding to David Gould’s comment on skepticism. Brendan just didn’t understand. Brendan also didn’t do well on his reading comprehension. At 2:28 I wrote: “The amount of CO2 emitted by human activity is minuscule compared with the natural emissions of the planet — which are due to warming since the LIA…”. I linked to this chart by the IPCC, showing both human and natural CO2 emissions. Anyone can see that for every 34 molecules of CO2 emitted in total, less than one of those molecules can be attributed to human emissions. The current alarmist claim that human emitted CO2 can be separated from other CO2 was debunked years ago by a number of peer reviewed studies, listed in this University of Oslo page. But expect the warmists to keep making the [repeatedly falsified] claim that all the CO2 above 280 ppmv comes from human activity. The vast majority of the rise in CO2 is the direct result of planetary warming since the LIA — not from the relatively minuscule human contribution. After completing the exercise, rate the AGW hypothesis on a scale of 1 to 10 for predictive prowess. I’d also like to know how the suppression of raw data and processing algorithms can be categorized as “the scientific method.” Smokey mentioned this anti-scientific practice several times, but none of the responses from his detractors have bothered to address it. Please try to do so! 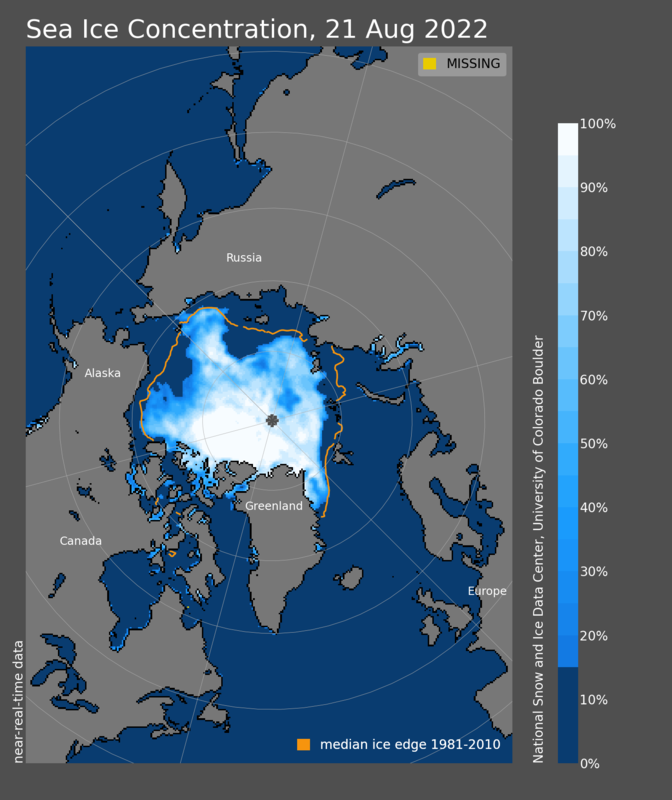 the Arctic summer melt season is from June 21 to September 22, 2010. But, but, what about the Danish Meteorological Institute ? Didn’t they at least have bad news about sea ice extent, when the threshold is 30% (unlike NSIDC and IARC-JAXA, which uses 15%) ? Gee, only the second lowest Arctic sea ice on record for this date in July. Let’s see how the final 2/3 of the melt season plays out, shall we ? Now, back to your premature celebration. Wow. I had no idea the Earth pays attention to calendar dates. Is she sentient? Now that’s a new AGW affect we haven’t heard yet. Anu, you can come up with something better than this. Your point is too silly to consider seriously. If 33 molecules of CO2 are emitted and subsequently absorbed there is no net change to atmospheric concentration. If 34 molecules are emitted but only 33 are subsequently absorbed the atmospheric concentration of CO2 rises. The claim that man’s “small” additional levels of emission cannot have an effect is patently false. If you get one extra piece of clothing to wash each week but don’t do it what happens across a year? I posted peer reviewed sources showing that your conjecture is wrong. You make the false assumption that the biosphere is incapable of absorbing that one CO2 molecule out of every 34+ that are emitted. Prof Freeman Dyson states that the biosphere will expand to eventually absorb excess CO2. So who should we believe? Prof Dyson and the University of Oslo? Or you, with your personal opinion based on a silly analogy about washing clothes? 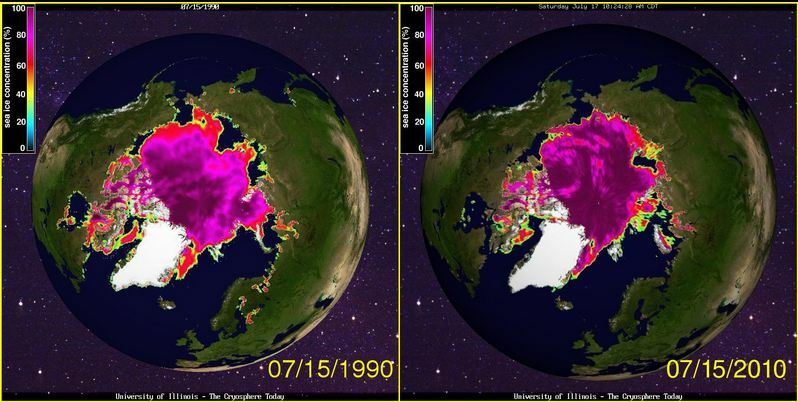 So you can see, in the interior of the ice pack, the ice extent is actually lower than in 1990. Thus, I don’t agree with your statement “I’m looking at areas of potentially perennial ice in the Arctic interior. There appears to be more ice there in 2010 than 1990 in the UIUC maps”. Where there is more ice in 1990 than today is in the Chukchi, E. Siberian and Laptev Seas, and this reflects the advection of older ice into these regions under the negative AO state this past winter and the low pressure. In the Beaufort there has actually been a slight gain of ice during the first 2 1/2 weeks in July because of the ice divergence, and yet it remains lower than in 1990. All other ice regions still show overall ice loss during July, with the fastest rates of ice loss in the Laptev and Kara seas. Right now the average rate of decline for the entire Arctic through July 17th is around 73,000 sq-km per day, way slower than in 2007, but I suspect it will start to pick up again, especially in the E. Siberian Sea. I would agree about CO2 absorption. Under oceanic out-gassing conditions we are likely to be in a more productive world. It is also likely that there is a lag related to it but that it eventually catches up, as in the greening of the planet IE more food. With more food you eventually have more animals eating that food, thus emitting more CO2. Eventually the energy forcing that CO2 enriched productivity is used up and we begin swinging back the other way. It is likely this is not a pendulum swing but a bunch of shorter term noisy events with longer term oscillations. The idea that CO2 absorption is static cannot be a reasonable in-situ tenant. Total human land clearance and fossil fuel comsumption has produced roughly 500 billion metric tons of carbon, enough to have raised the atmospheric concentration of CO2 to nearly 500 ppm. Concentrations have not reached that level because the ocean and the terrestrial biosphere do have the capacity to absorb some of the CO2 we produce. So the truth is in the middle – a proportion of those extra molecules are being absorbed and a proportion are building up. It is the latter that are responsible for AGW. You 1990 values add up to 5.578192 million sq km, while your 2010 values add up to 5.855146 million sq km. Maybe you gave incorrect data. Nitrogen absorbs UV but at a higher energy than oxygen which also results in photochemistry, i.e., it blows it apart to produce ions. the mesosphere and the oxygen ions dominate the stratosphere. The heating and cooling of the stratosphere is also a result of the mixing of the mesosphere with the stratosphere. When mesosphere cools, there’s a downward flow of air and the nitrogen ions gobble up the oxygen ions in the stratosphere which depletes the ozone. This cools the stratosphere and increases the volume of ice crystals which increases the Earth’s albedo resulting in cooling of the Earth’s surface. I’ll try to dig up a URL of a blog which provides a much better explanation of the dynamics of the ionosphere. The observation that the atmospheric concentration has been way higher in the past is indeed a devastating blow to the CAGW theory. Or it would be *if CAGW theory argued that CO2 is the only determinant of the temperature of the earth*. But it does not. Re the fraction of the total that are human caused CO2 emissions, the question is one of balance. As has already been explained, if the carbon cycle is in balance, then the atmospheric concentration will remain stable. We know from observation that over a relatively short period atmospheric concentrations of CO2 have increased significantly. 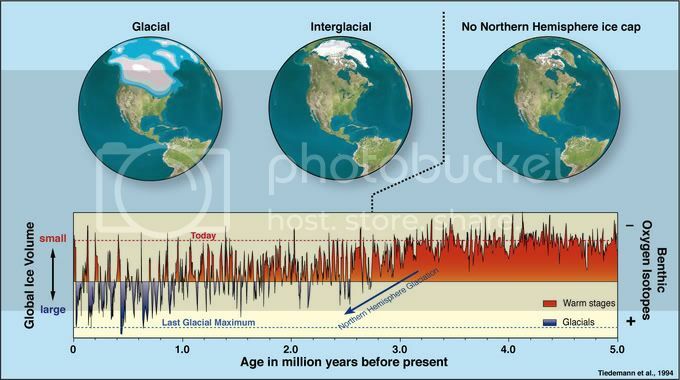 Thus, we know that relatively recently the carbon cycle started to go out of balance. We know that the thing that changed relatively recently was human emissions of CO2. We have pushed the carbon cycle out of balance, and thus the recent increases in atmospheric CO2 are due to us. We know that the biosphere is incapable of aborbing that extra molecule. Observation has demonstrated that the CO2 fraction in the atmosphere is increasing. Thus, absorption is not occurring. That’s some interesting data you just posted Julienne, totaling and taking the difference says 2010 on July 17th has 277,000 km3 more sea ice extent than in 1990 on the same day, interesting. If today’s arctic has more ice that twenty years ago, what is the real discussion? Thrasher, I’m not including all the regions in the Arctic, only those that border the central Arctic Ocean. Yes, there is still ice in the Canadian Archipelago, Baffin Bay, E. Greenland Sea. These regions are not the whole arctic. Wayne, when you include all the regions of the Arctic, then 2010 has less ice than in 1990. I was only looking at the central Arctic and the regions bordering it. And your prediction is …? Ok. Still amazing that these regions you listed above of some 5.5 million km2 of extent shows 2010 greater than 1990. I just find that very curious and I know it shifts year to year and date to date, still I find it curious. That’s twenty years ago levels, ok, just for these central regions. UIUC maps show only 30+% concentration ice. Your numbers are for 15+% concentration ice. Thus the reason why your numbers don’t agree with UIUC maps. I’ll just assume you were enjoying the summer with some alcoholic beverages today. The northern hemisphere “Summer” is from the June 21 Summer Solstice to the September 22 Autumnal Equinox. It’s not by accident that Summer is hotter than Spring. Did I mention Autumn starts September 22 ? That’s when the Summer melt season ends. The actual date of minimum sea ice extent varies a few days around that date. Mark it on your calendar. Anu, records reported for a particular date are not meaningful. It is a good example of data rich, information poor arguments. Trend lines are data rich, information poor. Global averages are data rich, information poor…etc…etc…etc. Give me your explanation, your thoughts, your insights, your review of references. Otherwise you are quoting phone numbers from the phone book, which would also be data rich, information poor. and I must have had a cache issue as I saw your post, went to check, pressed refresh and got a couple of new week’s data showing the line had crept above the 2007 again. So yeah who says I never fess up to a mistake… sorry. Neither. I’m saying that we have a situation where large quantities of man-made CO2 emissions are raising atmospheric levels. As far as we know, this is a unique occurrence, since never before in human history have we produced such high levels of emissions. Fair enough. Nevertheless, if the original claim can be shown to be wrong, the conclusion can also be shown to be at least doubtful. Whether or not that would constitute a falsification would depend on one’s view of the evidence. Which is why I called you on your straw man. To regard knowledge as more or less provisional, with varying degrees of certainty, is to adopt a properly sceptical attitude. That’s advocacy talk there, Smokey. What happened to 100% scepticism? So these two people actually agree? Makes my heart feel warm. Brendan me boi, you wouldn’t know skepticism if it bit you on the a… nkle. This newfangled CO2=CAGW conjecture claiming that a tiny trace gas will lead to thermogeddon is just a silly notion invented to generate grant money and power for the unelected, nothing more. Here’s a pie chart showing the fraction of atmospheric CO2: click. It’s a free country, they say, and you are entitled to the crazy belief that a tiny trace gas rules the climate, and that any change is automatically bad. It doesn’t and it isn’t, of course, and any incidental warming is drowned out by many other, more important factors. CO2 follows temperature; that is observable across all time scales — while the notion that CO2 causes any measurable global warming has yet to be shown with any testable, empirical evidence. But by all means, continue to believe that CO2 is gonna getcha, against all the evidence. It won’t, but some folks have a need to worry about imaginary events. This chart shows more correlation with temperature than CO2 ever had. Anyone who is not skeptical of the repeatedly falsified notion that CO2 will cause runaway global warming probably believes in Santa Claus and the Tooth Fairy, because they aren’t really skeptical of anything. Your reference to “large quantities of man-made CO2 emissions” and “high levels of emissions” are obviously relative to the atmosphere as a whole. @Smokey: Arguments based on the absolute proportion of CO2 in the atmosphere (~31 ppm as of April 2010) are stupid. If you disagree, you’re welcome to prove your point by breathing air with 391 ppm of hydrogen cyanide, or 391 ppm of carbon monoxide. After all, these trace gases can’t possibly be harmful. @Steve Goddard: The recorded temperature at the POPS13 buoy is now around -13 degrees C. Are you going to claim that’s genuine data, or admit that it’s likely the instrument is malfunctioning? Edit: that should of course be ~391 ppm CO2, apologies for the typo. That failed analogy is like saying water is dangerous because you can drown in six inches of it. Peter, if your analogy is a good comparison between trace gasses being toxic, you seem to infer that animal life would be improved. However, you would be wrong. We would all be anaerobic one celled bacteria without CO2, and lots of it. Without carbon dioxide residing in our lungs, we would not be able to take our next breath. CO2, as a gas, is as necessary for breathing animals as certain trace minerals are, which without them, we would not survive long. If the harmful level of CO2 is 5000 ppm then 381 ppm is but 7.6% of that harmful level. Your argument be more successful if you asked to prove the point by breathing in 7.6% of the harmful level of hydrogen cyanide or carbon monoxide. Or maybe it wouldn’t? More advocacy, Smokey? Let’s see your 100% scepticism in operation. What prevents you taking a 100% sceptical stance about your own claims? Just by way of interest, what would constitute “testable, empirical evidence” for CO2-induced global warming? Sorry Steve, its clear you don’t know what you’re talking about here. Similarly to vapor pressure, temperature is a statistical concept – it is the measure of average kinetic energy of molecules in a substance. So from your statement above, an individual molecule also has no ‘knowledge’ of temperature… Speaking of which, it is strange to say ‘molecules freeze.’ Sorry Steve, individual molecules do not undergo phase changes, the phase is a bulk measure of an ensemble of molecules. Your arrogance astounds me. I think a basic course in thermodynamics would do you some good. By your omission, you are admitting that CO2 has been higher in the past, regardless of source, which agrees with the science. Plants and animals survived. Man is still here. WUWT? More correctly: An individual molecule has “approximately” no “knowledge” of the macroscopic observable quantities of the gas it is part of (This is almost true when gases are nearly ideal, that is, when intermolecular forces are negligible). Sorry for being OT here, though! Skeptics are not advocates of anything. The job of advocacy is for the purveyors of the globaloney hypothesis. Smokey, I’m not in the business of making predictions, even though I participate in the SEARCH outlook. I’m more interested in understanding the factors responsible for changes in the ice cover since I understand the importance of atmospheric circulation in forming the summer ice cover, and no one can predict the weather. [Beautiful name, BTW], that’s not really a prediction. Too many caveats. I agree about her name, but differ in that I respect her for not making a specific prediction when she does not think she has sufficient facts to do so. If the IPCC had taken the same approach humanity might not be in the mess we’re in. Perhaps that question should be diverted back to you, since the burden of proof is upon your side…to show it forth. Skeptics don’t have to do a damn thing. It is business as usual, another day in the natural variability of the Earth. Or better yet, where’s your proof? Let’s see it. Show the empirical, testable evidence of the link between CO2 and the so-called CAGW. As Smokey is correct to demand: Evidence. I’m not sure which “omission” you are referring to, but human beings are dependent on climate for their well-being. In a world of 6bn people, the margins for error from large-scale climate change are much less than when there were fewer human beings. For the past 10,000 years, the perod of the rise in complex societies, average global temperatures have varied by perhaps no more than 2 deg C. Even so, changes in climate during that time have no doubt caused much hardship and even been implicated in societal collapse. So while there’s uncertainty about the future impact and extent of climate change, the issue isn’t so much survival as harm, particularly the risk to those who live in areas that are more vulnerable to the effects of a changing climate. True, Smokey, but my questions weren’t addressed to a sceptic. They were addressed to you. Here some square miles for your kitten. Global temps have varied by no more than 2°C ?? Since you are flat wrong about that, it calls into question your basic [mis]understanding of the science involved. But thanx for playing, you provide risible entertainment. Clowns do the same service to the public. It is certainly more open at this time of year than it was in 2007, 2008 and 2009 (all three years that saw an opening of the NWP–though in 2008 the Parry Channel was not open, only Admundsen’s Route). I’ve been arguing with Just the Facts since spring about southern ice extent and said all along that the Antarctic would hit the buffers, it now has. Meanwhile the Arctic will stay low. It’s July, nothing is freezing up … things get filled with snow or slush….